At MDFI, we have the honor and privilege of training folks from all walks of life and every profession under the sun. For whatever reason, they have chosen to not only carry a gun to protect themselves, their loved ones, and innocent life, but they have also chosen to continue their training to be the biggest asset they can to their fellow man as a responsibly armed citizen. There are many in our citizenry however that take their desire to be a boon to society even further by undertaking the oath and dedication to being a sworn law enforcement officer. Even though only some of the MDFI cadre and Alumni are past and current law enforcement members, all of us know full well the responsibility levied on the shoulders of our brothers and sisters in blue, brown, and green around the country. 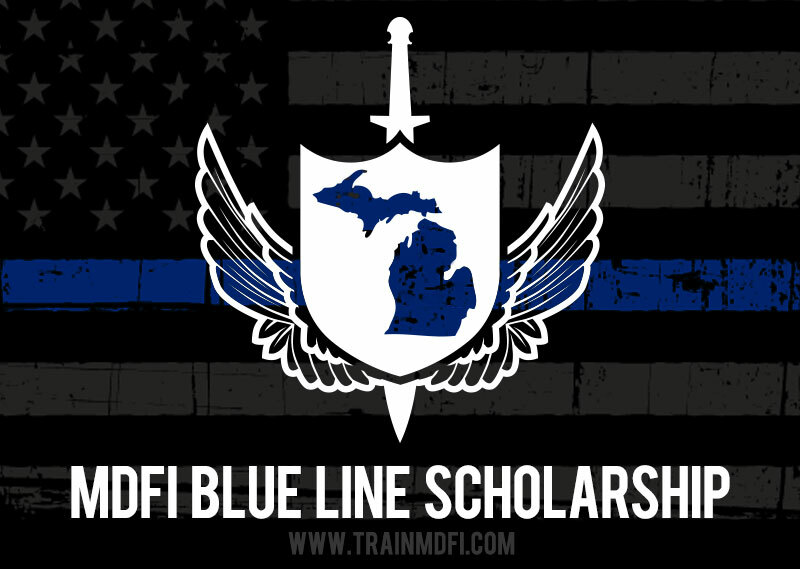 With a desire to help our Michigan Law Enforcement Officers receive much-needed training when the department cannot assist, MDFI is proud to offer the MDFI BLUE LINE SCHOLARSHIP effective beginning in 2017. The BLUE LINE SCHOLARSHIP will offer one spot for an Active or Reserve Law Enforcement Officer from the state of Michigan in each of our MCOLES certified classes tuition-free (but a $25 range fee is applicable). Print and fill out the MDFI Blue Line Scholarship application, attach a photocopy of your credentials and mail the form in to the address on the application. All officers selected are eligible for one free class per year. This will allow us to assist as many LEOs as we can. The next calendar year, new applicants will have priority however prior attendees under the scholarship may resubmit. You will be notified via email when you are selected and registered for a class and all you need to do is submit payment for the $25 range fee and show up with the required gear.